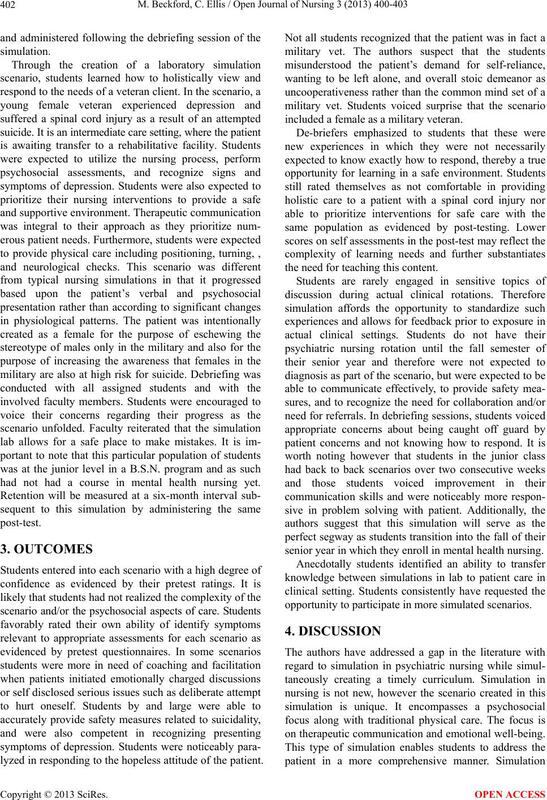 simulation was found to improve student outcomes. urgent healthcare needs of military veterans. Health Administration (VHA) costs $12 billion . post 9/11 veterans for mental health problems . vets who are living with very serious injuries. mental-health issues and traumatic brain injuries . brain injury, depression, and other clinical issues . tional, sexual, cultural, social and spiritual needs . scenarios designed to decentralize mental health concepts. material prior to their scheduled simulation experience. 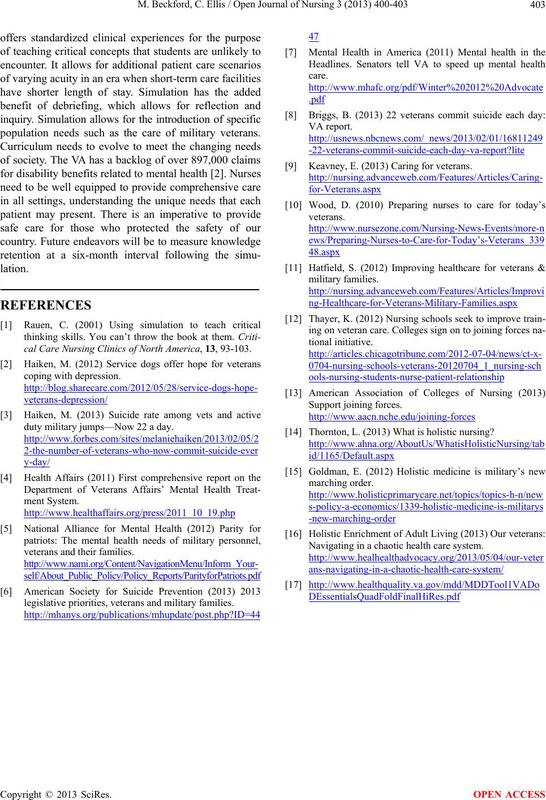 research that supported evidenced based practice. Simulation was a mandatory assigned experience. anonymously through the survey monkey website. care and identifying appropriate nursing interventions. had not had a course in mental health nursing yet. lyzed in respond ing to the hopeless attitude of the p atient. included a female as a military veteran. the need for teaching this content. senior year in which they enroll in mental health nursing. opportunity to participate in more simulated scenarios. on therapeutic communication and emotional well-being. population needs such as the care of military veterans. cal Care Nursing Clinics of North America, 13, 93-103.
duty military jumps—Now 22 a day. legislative priorities, veterans and military families. Keavney, E. (2013) Caring for veterans. 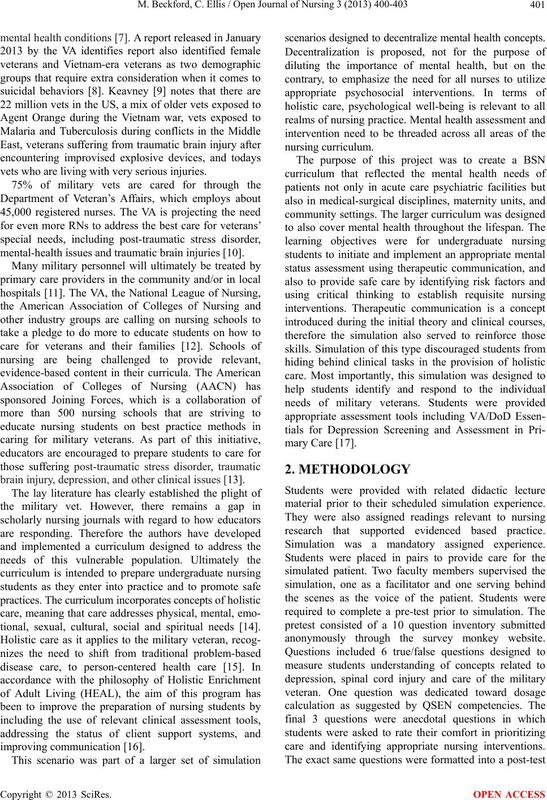 Thornton, L. (2013) What is holistic nursing? Navigating in a chaotic health care system.